Help locate the missing members of the Edrald family. Edrald Estate — Discover what happened to the Edrald family. Federic Seychelle, the betrothed of Arlie Edrald, has asked for my assistance in locating the Edrald family. He returned to prepare for his wedding to find that they had mysteriously vanished from their estate. Talk to Federic, Dulkhi, and Arlie. With no other leads to go on, the manor house seems like a good place to begin our search. In the chambers of the Baroness, we found a journal indicating she was most concerned about their servant, Dulkhi. A search of the servant's quarters may prove enlightening. Federic found a journal in Dulkhi's quarters. Perhaps it will shed some light on what happened here. Dulkhi's Diary indicates an affair was going on between her and Arlie Edrald. What's more, it suggests that the Baroness hid something in the windmill not far from the estate. Hidden away in a toolbox, we found a key to the manor undercroft. Perhaps we will find what we are searching for, there. A thorough search of the Undercroft may be the only way to uncover what happened here. I located a ritual book detailing the process of opening a portal to somewhere called the Deadlands. The book seemed to indicate the basins are the key to activating the gate. A note scrawled in the margin said that the fire basin is the one to start with first. I managed to affect a change in the atmosphere surrounding the Daedric gateway in the center of the Undercroft. I should continue experimenting with the basins to see what I can accomplish. Further success in my attempts to activate the gateway! These basins are the key. 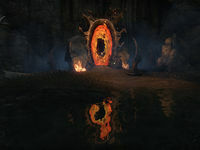 I managed to activate the Daedric portal. If the tome is correct, it should lead to somewhere known as the Deadlands. We found Arlie Edrald and Dulkhi on the other side of the portal, evidently unharmed. Arlie Edrald may know where I can find the rest of her family. Dulkhi will accompany me [sic] on my search for the Baron and Baroness Edrald. 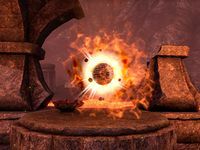 With the Edrald family safe, I must see about destroying the Sigil Stone to ensure this portal remains forever sealed. The Edrald family has been safely returned to their estate. I should speak with Federic Seychelle and see if there is anything else I can do. Stage when Federic decides to stay. Finishes quest (Stage will depend on choice made. )Federic Seychelle has elected to leave the Edrald Estate, while Dulkhi has resolved to stay. Arlie Edrald wants to speak with me before I go. Needs stages where both leave, both stay and federic stays while dulkhi leaves. This page was last modified on 25 December 2018, at 20:01.